Drew McMillin tries to get past a defender in the second half. McMillin finished with 14 points––12 in the second half. A fast start is nice. A big finish is even better. 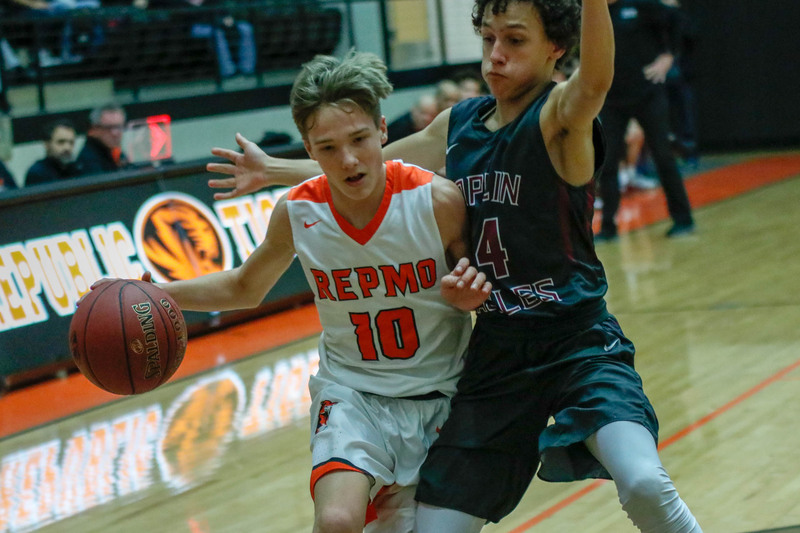 For the Tigers at home Friday against Joplin, they got the big finish they needed to top the Eagles 56-50 and stay undefeated in the Central Ozark Conference. Joplin roared to an 11-0 start with a red-hot shooting performance in the opening minutes. 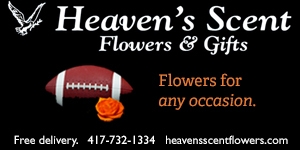 But even when the Eagles dominated the scoreboard to open the game, coach Tim Brown thought his team was doing what it had planned to do. Republic scored ten consecutive points of its own to close out the first quarter, and the Eagles held an 11-10 lead after one. Joe Rexroat came off the bench during that span and picked up six points in the first quarter to help right the ship for Republic. Republic stayed close, but Joplin held the lead for most of the night. The Eagles’ margin hovered between one and six points throughout the second and third quarters until a jump shot by Tucker Thomas with 55 seconds remaining in the third quarter gave Republic the lead for the first time, 35-33. Republic led 35-34 heading into the final period. Joplin opened the fourth quarter with a three-pointer to take the lead again briefly, but is was the last time the Eagles would be on top. Drew McMillin answered with a trey at the other end to give the Tigers a lead they would never relinquish. McMillin and Broc Smith were huge down the stretch. Smith scored 11 an McMillin scored seven in the fourth quarter as Republic outscored Joplin 21-16 to pick up the victory. Smith finished with 20 and McMillin had 14. “I’m just really proud of our guys,” Brown said. “[We] had a lot of foul trouble. We played a lot of guys tonight and it was a group effort––all hands on deck––and it’s fun whenever we’re able to do that for our guys. Republic is now 17-6 overall and 6-0 in the COC. They host Nixa Tuesday. Before the game, the Tigers celebrated Winter Courtwarming. Karson Thomas was crowned courtwarming queen.